An English brown ale with enough hop bite to balance the malt backbone. Mr. Wizard gives advice to a new all-grainer. The Wiz lets loose with his opinion on wort loss. Yeast do not live by maltose alone. Find out what nutrients they need and how to ensure you have the proper amount in your wort. How yeast ferment sugar and produce flavor and aroma compounds. Start your own yeast lab. 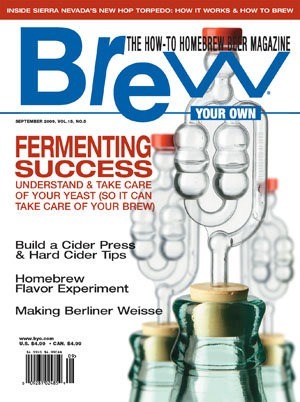 Advice on how to handle your yeast and manage your fermentations. How did Saccharomyces cerevisiae become a good brewing yeast? The brewers at Sierra Nevada have come up with a new device to improve the extraction of hop oils during dry hopping. Meet their torpedo — and the beer that carries its name.